Scary moments as an SUV rolls down an embankment and nearly into the water Monday afternoon. 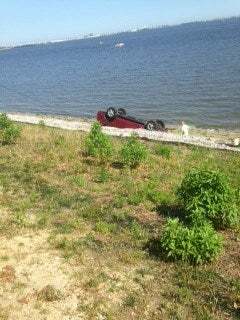 This happened just after 3:00 p.m. at JFK Park in Somers Point. Police say the 72-year-old driver pulled in to a parking spot and just kept going. The SUV rolled down an embankment and flipped over onto a short strand of beach. Pablo Lora witnessed the incident, "I was here cooking and I heard a woman screaming, call the police, call the police, and I look over and there and there's a jeep went down, so I ran down there, and I saw the woman was stuck so I broke a window and brought the dog out. And then the police came and everything. The driver suffered only minor injuries. She refused treatment on scene. A dog and cat were also in the SUV, police tell us they, too, are okay. The incident remains under investigation.